I am a Dresden Files addict. I am, frankly, more than a little in love with Harry Dresden. 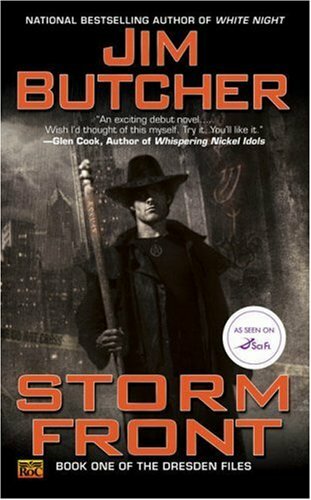 Recently I re-read Storm Front, the first book in Jim Butcher‘s series. I love this series so much that I have actually read all of the books, but this was for a new book club that I’m in, and I was very happy to refresh myself on how Harry’s exploits began, because I truly feel that this series is urban fantasy at its best. Harry Dresden is a wizard for hire in Chicago. Far from being superhuman due to magical prowess, he is a wonderful “everyman” character, who suffers from many of the same flaws as typical mortals. Often, things don’t work out quite right for him, he gets beat up a lot, and many times finds himself in at best uncomfortable and at worst life threatening situations. In this first book, he goes up against a rogue necromancer who is killing people and who eventually gets around to threatening Harry’s life. To complicate matters, Harry routinely works with the police force, especially the cop Murphy, who has little time for the complexities of how the wizard world interacts with the human world. And to complicate matters further, on this particular case Marcone, the local crime king, has specifically asked Harry not to investigate. Somehow, throughout it all, Harry manages to save the day, navigating as best he can between all of the different priorities and life threatening situations, making hard decisions, fighting off giant scorpions and toad-like demons, while always keeping what is right at the forefront of his mind. One of the reasons that I fell in love with this character was because of his constant struggle to do the right thing. He is often accused of using his powers for nefarious means (especially by the Warden Morgan from the White Council of wizards), but in reality he always makes decisions based on the needs of others, even if the cost for himself may end up being high. Butcher does an excellent job of keeping the pressure on just enough to keep the story going, while allowing the reader to get to know Harry and understand him. He doesn’t use his magic for personal gain, and for all of his strengths there are weaknesses that balance him out. For example, his powers interfere with things that run on electricity, so no fancy car or computer for Harry. Instead, he drives a beat up old VW and does a lot of his detective work the old fashioned way, with just a little help from some locator spells. He is also not the best at relationships. Often this is a problem that is caused by him having to weigh out what information he can share, such as with Murphy or his potential girlfriend, Susan. We see everything through Harry’s eyes, though, so we can understand his struggle and cheer him on, because we can see that he’s essentially a good guy. One of the best. The setting for these books is good, too. Using the fairly familiar backdrop of Chicago gives us a way to envision Harry’s world. However, there is also an alternate realm, the Nevernever, that houses all manner of fae creatures. Harry is able to open a doorway into this world, if needed, but as with all interactions of the fae kind, it is dangerous and tricky. Throughout the series, Butcher develops this part of the storyline more deeply, and there is a really nice balance between the “real” and the fantastic. Possibly the best that I have seen done in urban fantasy. Character development throughout the series is good, too. History is created between different individuals – mortal and fae – and often this comes back in both helpful and detrimental fashion. The relationship between Harry and Murphy is an interesting exploration of partnership. And, there are some fun characters in the books, too, such as Bob, the incorporeal being who sometimes advises and assists Harry, lives in a skull, continually wisecracks, and loves to indulge in steamy romantic novels. If you haven’t checked out this series yet, I highly recommend it, but must caution you – you may become addicted! Now is a great time to start, since there are 15 books in the series so far with the most recent, Skin Games, having just been released.